Zombies on the Titanic? Sure, why not. Have you ever wondered what it’d look like to see people fighting off hordes of the living dead on the Titanic? 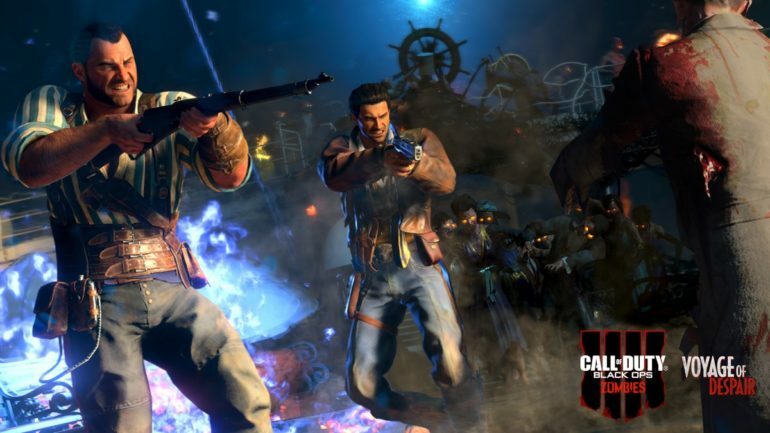 That’s exactly what you get the chance to experience on the Call of Duty: Black Ops 4 Zombies map, Voyage of Despair. Voyage of Despair is a fun map with a lot of twists and turns throughout the ship. But it’ll definitely take some time for you to get used to all of the different areas around the map. You’ll face off against unique zombies and get the chance to try out a brand-new wonder weapon on this map. And there’s also some of the traditional Zombies features that are there to help players aspiring to make it to high rounds. Here’s what you’ll need to acquire or unlock to survive in Voyage of Despair. As with most Zombies maps, the shield is an important buildable object that helps protect your back from zombie attacks. Similar to IX, this Ballistic Shield is pretty easy to make, too. You’ll just want to make sure to activate the Sentinel Artifact in order to open up all of the areas of the map. The first shield part only has two spawn locations, both of which happen to be on chairs in the State Rooms area of the map. If you run into State Rooms from Forecastle, the first spawn point is on a chair down the hallway and to the right. The other location is on a chair in a room on the left—you can get there from the first spawn point by running through a connecting closet. The next shield part can be found in three separate spots in the area at the top of the ship called Bridge. The possible spawn locations are on a wall left of the captain’s steering wheel, on top of a crate in a room down the hall, and on the back wall closest to the Upper Grand Staircase. The third and final shield part is located at the bottom of the ship. It can spawn in two spots in an area called Provisions—it’ll either be on some boxes near the ICR-7 wall buy or down the left hallway on the wall in a dark room. If the part isn’t in either of those two locations, then the last place it can be is one story above Provisions, on a wall in a location known as Third Class Berths. The Ballistic Shield also comes with a pistol that you can shoot while holding the shield, which is useful in case you get trapped in a corner or stuck in any tricky situations. We definitely recommend building this shield as soon as you can on Voyage of Despair. The Pack-a-Punch machine is another essential aspect of most Zombies maps since it allows you to upgrade your guns. And just like on IX, it’s relatively easy to get the Pack-a-Punch up and running on Voyage of Despair. Essentially, there will be four ritual symbols scattered around the map that you’ll need to collect. These symbols won’t become available until you’ve activated the Sentinel Artifact, however. And the order in which you collect these parts matters because the Pack-a-Punch will spawn at the pedestal where you pick up the fourth and final symbol. If you head down toward the bottom of the ship in an area called Mail Rooms, go for a swim in the Cargo Hold. You’ll find one Pack-a-Punch pedestal and symbol at the back of Cargo Hold. Another pedestal can be found at the very bottom of the Lower Grand Staircase. You’ll also need to go for a swim to get another ritual symbol. Head to the Provisions area where you looked for the third piece of the Ballistic Shield. Go into the Engine Room and dive underwater near the big red door. The pedestal will be in a separate area called Turbine Room. The final Pack-a-Punch pedestal is on the Poop Deck, right near the area where you activate the Sentinel Artifact. We suggest activating this pedestal last so the Pack-a-Punch machine initially spawns here, giving you easier access to the machine and a safer place to upgrade your guns. The Kraken is a unique wonder weapon available in Voyage of Despair—and it’s a lot of fun to use. Unlike the Death of Orion from IX, however, you don’t have to go through an extremely-lengthy process to unlock the Kraken. This wonder weapon is more comparable to the Blundergat from Blood of the Dead because you can get the Kraken from the Mystery Box or you can complete a short process to get a free version of the gun. After you’ve opened the chest, you’ll need to fill it with souls by killing zombies in that specific location. Once it has received enough souls, the chest will move to another spot on the list above, and you’ll need to kill more zombies at this new location. Repeat this process three times to make a new item appear in the chest. Five potential items can be found in the chest. You’ll need to head to the top of the ship and find a crate with the corresponding item that was in your chest. Once you do this, a giant tentacle will show up and put a free Kraken on that crate for you. If you upgrade the Kraken in the Pack-a-Punch machine, you can also go through a separate process of further improving this wonder weapon. There are four elemental upgrades for the Kraken, each with their own unique way of dishing out a ton of damage. If you want to make it far in Voyage of Despair, we definitely recommend adding an upgraded Kraken to your arsenal.